“That’s the first time I’ve seen that. Yeah, see what I’m talking about? They have fun here, but they win doing it,” a smiling Young said before the Warriors’ preseason opener against the Denver Nuggets. Young, 32, has earned a reputation as one of the NBA’s most intimidating 3-point shooters. The 11-year NBA veteran entered Monday’s game against the Dallas Mavericks just 80 3-pointers shy of 1,000 for his career. The 6-foot-7 shooting guard once scored a career-high 43 points and has a knack for making 4-point plays. He also played with Los Angeles Lakers legend Kobe Bryant during Bryant’s final season in 2015-16. But the drama has often overshadowed those notes on Young’s NBA resume. 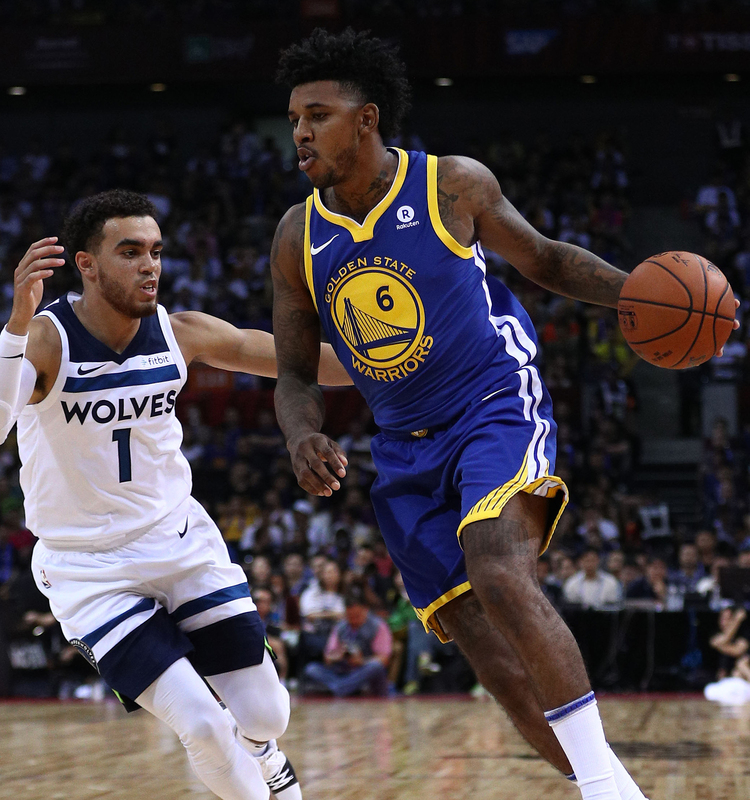 Nick Young (right) of the Golden State Warriors in action against Tyus Jones of the Minnesota Timberwolves during their game Oct. 5 that was part of 2017 NBA Global Games China at Universidade Center in Shenzhen, China. “I am pretty much still ‘Swaggy.’ But I just want people to know that I’ve been through some stuff and overcame some stuff,” Young said. Young was a member of the Washington Wizards on Dec. 21, 2009, when teammates Gilbert Arenas and Javaris Crittenton had a locker room confrontation that ended with Arenas pulling out a gun. Young was one of four Wizards players fined $10,000 apiece by the NBA on Jan. 9, 2010, after Arenas made light of the incident by pointing his index fingers at teammates as if he were firing guns during a pregame huddle. Arenas ended up being suspended for most of the 2009-10 season because of handgun violations stemming from the incident and for subsequent actions. Young was also known for putting his arms up in triumph and turning his back to the basket on a missed 3-pointer during a game with the Lakers. His relationship with rapper Iggy Azalea was chronicled on social media, and the two were engaged in June 2015 while Young was playing for the Lakers. But in March 2016, a cellphone video surfaced that then-Lakers rookie guard D’Angelo Russell taped in which Young answered his questions about being with other women. Young did not appear to realize he was being recorded. Russell faced a tough Lakers locker room and was ridiculed on social media, while Young was chastised for his words and actions. Azalea eventually broke off the engagement with Young after problems in their relationship continued to surface. Young feared that his drama would cause his hometown Lakers to trade or waive him despite having one year paying $5.4 million remaining on his contract for the 2016-17 season. 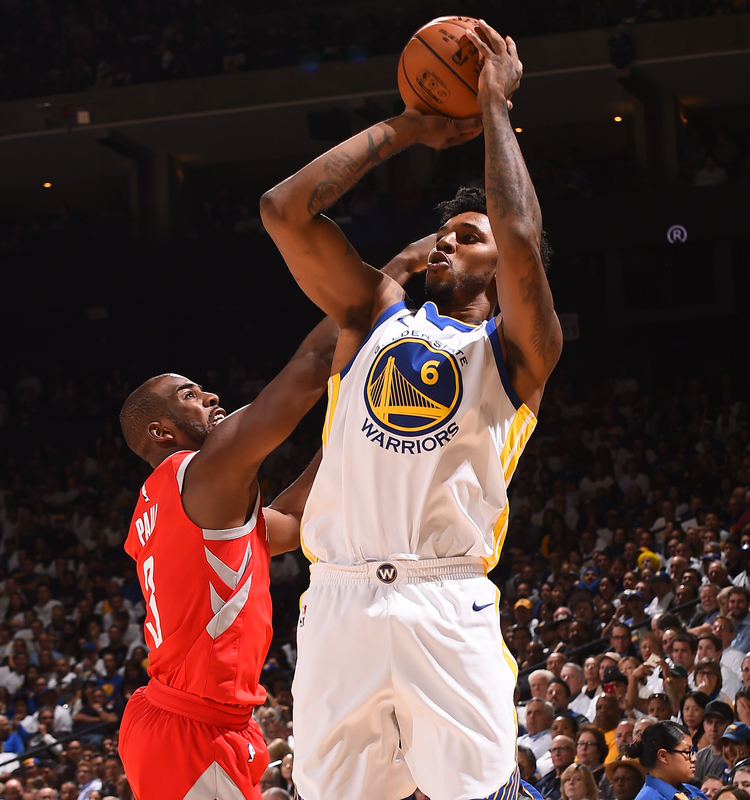 Nick Young (right) of the Golden State Warriors shoots the ball against the Houston Rockets on Oct. 17 at Oracle Arena in Oakland, California. Young said he finally felt comfortable that the Lakers wanted him back last season after receiving a positive phone call from then-first-year head coach Luke Walton. Young proved he could still be productive, averaging 13.2 points while shooting a career-high 40.4 percent from 3-point range. “Luke called me and just told me to control what I can control. Luke was pretty big in all of this,” Young said. Young’s days as a Laker ended when he became a free agent during the offseason. He said he desperately needed a change of scenery from the Lakers. Meanwhile, the Lakers traded Russell and center Timofey Mozgov to the Brooklyn Nets on June 20 for center Brook Lopez and the 27th overall pick (Kyle Kuzma) in the 2017 NBA draft. Young entered free agency having appeared in the playoffs in only two of his 10 NBA seasons, playing in 15 postseason games, the last coming in 2012 with the Los Angeles Clippers. It certainly was music to Young’s ears when his agent, Mark Bartelstein, called saying the reigning NBA champion Warriors were interested in him. Warriors coach Steve Kerr and All-Stars Kevin Durant and Draymond Green met with Young in Los Angeles over lunch in early July to recruit him to join the champs. That gesture during a short offseason for the Warriors meant a lot to Young. Kerr said his selling point to Young was that he fit the Warriors “perfectly” because he was a 6-foot-7 guard who could play multiple positions and shoot well. Kerr also told Young that he was happy about his improvement as a defender last season, but he didn’t promise major playing time on his deep team. Championship expectations were sold as well. “He has the potential to fit in beautifully with us, and we have the idea of winning a championship to offer to him,” Kerr said. “He’s been a really good player in his career, but he’s played on a lot of bad teams, frankly, so I think the appeal to Nick was to come play with this group of players. He’s a great fit. “We’ve got a lot of people, and I explained to Nick that the numbers are probably going to be different, but over the course of the season, between injuries, resting guys, he’s going to get his chance to play, and he fits in beautifully with all the playmakers we have. Durant said he told Young he would be joining a “great environment” and he would “have fun” playing with Golden State. The 2017 NBA Finals MVP would definitely know since he won an NBA title in his first season with the Warriors. Durant also said that Young’s personality “fits perfectly” with Golden State. 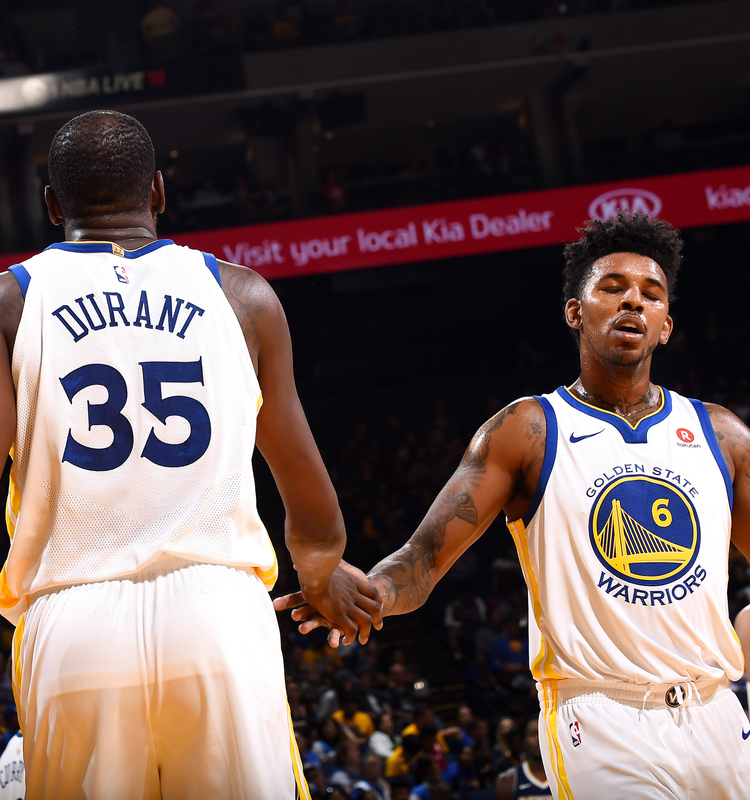 Kevin Durant (left) and Nick Young of the Golden State Warriors high-five each other during their preseason game against the Denver Nuggets on Sept. 30 at Oracle Arena in Oakland, California. “It’s tough. Going from the bottom to the top, it was hard. But I made it through. I stayed with it. Kept the faith. Basketball sent me on a roller coaster,” Young said. Young’s former Wizards teammate JaVale McGee also gave him some positive reasons for joining the Warriors. McGee went from a ridiculed player to NBA champion with the Warriors last season. He was emotional and thankful after winning his first title. Young said McGee told him that the Bay Area accepted him for who he was and just cared about winning and having fun. Young also believes that his laid-back and fun personality fits the renowned laid-back Warriors, who often blast music during practice. Young said he was nervous when he first arrived at Warriors training camp. Kerr also had no problems saying that the newcomer was not in great shape either. Young had previous experience playing with a superstar in Bryant, but joining an NBA team that won two of the last three titles and has four All-Stars in Durant, Green, Curry and Klay Thompson was intimidating at first. After Kerr urged Young to be himself on the first day of training camp, Young relaxed and let his 3-pointers fly. “Like Kobe, it’s a totally different set of stars,” Young said. “Kobe, you had to say, ‘What’s up?’ to him and talk to him. He was very standoffish. But these guys, once I came in, were already all jelling. It was kind of like family. Young made his presence known immediately in his Warriors regular-season debut, nailing 6 of 7 3-pointers en route to 23 points off the bench in a loss to the Houston Rockets on Oct. 17. He has made 9 of 13 3-point attempts through his first three games with Golden State while averaging 14.3 minutes per game. Kerr has said that Young’s role will probably change game by game, but it appears he will remain a rotation player. Young was also on hand as his teammates celebrated their 2017 NBA championship on Oct. 17 by raising their championship banner and getting rings. Expect a major celebration from Young if he becomes a champion with the Warriors this season after everything he has gone through. “You got to grow through all of that,” Young said. “To go through what I’ve gone through, you got to just be thankful and enjoy because you see at any time this can go [away]. But now I’m playing on a championship-contending team.